Change is best undertaken with a plainly stated purpose in sight. 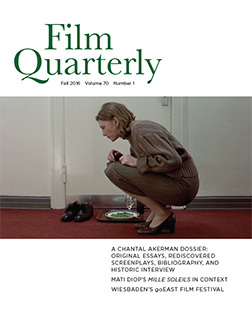 The new formats that are visible in this issue are meant to enhance Film Quarterly’s appeal to people who think seriously about movies, whether they do so inside or outside the academy. The crucial premise is that readability can be increased without compromising intellectual rigor—for surely compact lucidity, and indeed eloquence, are intellectual virtues. All contributions now conform to well-defined length parameters. These limits are not bureaucratic contrivances, let alone short cuts; they are effective tools for promoting the fluency that befits a scholarly magazine which addresses a broad audience. Lengthy academic writing, no matter how brilliant, is often excessively demanding of a non-specialist reader’s time and so it may simply not be read by such a person. If inclusive communication is a priority—as in the present context it must be — then succinctness is a special virtue. 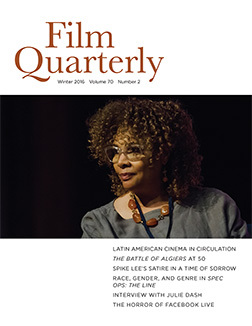 And so as well as timely essays of about three thousand words, book reviews, and articles, Film Quarterly now includes columns, each of them with a clear brief. This “Editor’s Notebook” outlines the issue’s contents, explains policy where it is helpful to do so, and notes some films that are not otherwise covered. “Marx and Coca-Cola” comments on recent theatrical releases. 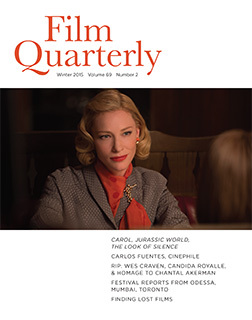 “Hollywood Notebook” offers a director’s reflections on filmmaking. “Camera Ludica” deals with games and gaming, “Two-point-Zero” with Internet video. “Counterspectacles” and “Second Time Around” are DVD columns—the one concerned with non-mainstream work, the other with reissues—while “Browsed” consists of short book notices. The new formats and emphasis on concision are intended to improve accessibility. The model is something like a civic meeting—a structured forum for conversation and contention in which seminar-room topics mingle with wider debates. It should be a forum where there is more heat than smoke, more panache than pedantry, where well-argued dissent routs dogma, but above all it has to be welcoming to both general and professional readers. 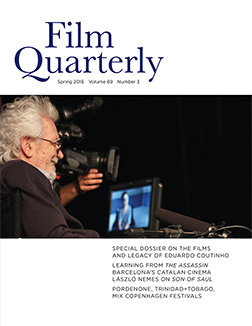 The wider question of change in film culture is inseparable from digital technologies, which are shifting what we mean when we speak of “movies.” In addition to new production and distribution practices, the increasing commercial influence of the games industry and the proliferation of online moving images, especially streaming video with accompanying “peer-to-peer” commentary, are significant. 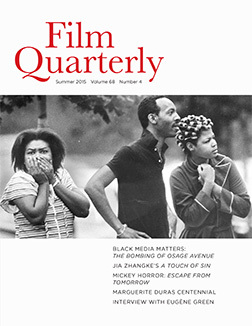 Several contributions to this issue are concerned with digital matters, the most in-depth of them being Lucas Hilderbrand’s article about the vast and interactive storehouse of clips that is YouTube. 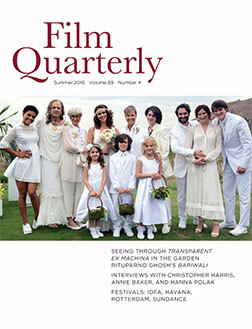 Discussing what online clip-viewing entails and how it is affected by copyright considerations, Hilderbrand does not fail to refer to specific works (under the rubric of a clip canon): the stress on new screen media does not indicate a downgrading of Film Quarterly‘s policy emphasis on interpretation and close analysis. Nor is cinema history to be neglected. 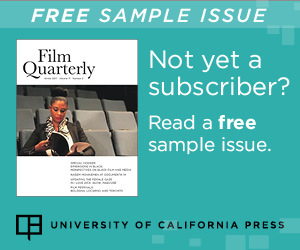 Kelley Conway’s investigation of the reception of Cleo from 5 to 7, D. A. Miller’s rereading of Sansho the Bailiff, and Johannes Von Moltke’s essay on books about Nazi cinema underline a reaffirmed commitment to historical research and re-evaluation. Robert De Niro’s disappointing CIA saga, The Good Shepherd, encapsulates themes that have been unmissable in films lately: infiltration, suspicion, treachery. “There’s a stranger in the house,” as Edward Wilson (Matt Damon) puts it. Notes on a Scandal also explores this territory, as does The Last King of Scotland. The Lives of Others, a breakthrough first feature with one of the best-constructed endings of recent years, pictures an espionage state—a state run on suspicion, a house with bugged walls and strangers literally skulking in the attic. A combination of Hitchcockian surveillance thriller, arthouse melodrama, and moral fable, The Lives of Others has delighted audiences and won its director Florian Henckel von Donnersmarck not only the Academy Award for best foreign language film, but also a U.S. remake deal. In his review essay, Matthew H. Bernstein elaborates the means, notably a multiplicitous use of irony, by which the film builds to an extraordinary emotional crescendo. Do the intrigue, hostility, and deceit that abound in current films relate to iniquity in the public sphere? Probably they do, but, as Joshua Clover suggests overleaf, analyzing popular culture in these terms is not very enlightening at the moment. Maybe the cinematic motif of domestic danger is less an allegory than a diffuse cultural worry about trustworthiness that keeps being recycled and restyled. 28 Weeks Later and Curse of the Golden Flower are cases in point. In both of them violent fathers are chief agents of strife; but 28 Weeks Later’s Don (Robert Carlyle) is a rabid, mangy mongrel dog, whereas Emperor Ping (Yun-Fat Chow) is a lion with a pomaded mane. Though there is precious little natural light on show in either film, that similarity is incidental: 28 Weeks Later is often firelit and scary like a “survival horror” video game, while Curse of the Golden Flower glows with ceremonially gaudy palatial ornament. The differences are syntactic also: the cutting in 28 Weeks Later is bewilderingly fast, whereas much of Curse of the Golden Flower is stately. Its most outrageous violence unfolds in slow motion, Ping’s hair falling gently over his face as he gets ready to bludgeon his youngest son to death. In their different ways, these two films are exhilarating because of histrionics and visual flair. They both careen enjoyably toward melodrama or even black comedy, and meanwhile whatever rickety allegory there is gets swept away in the aesthetic mayhem. Days of Glory and 2006 Cannes Grand Prix-winner Flanders, however, the one specifically rooted in history, the other deliberately vague in its connotations (there is war, but it is not clear where or when it is taking place, or even if it is a fantasy), are two French films with an outright claim on political significance. For Emma Wilson, they amount to a heartening revival of the radical cinema of Alain Resnais (now eighty-five, whose own most recent work, Private Fears in Public Places, is out now on DVD). Flanders ends on a note of unexpected tenderness; a solemn, silent private ceremony of reconciliation concludes The Lives of Others. Internecine conflict does not entirely carry the day, even in those films taken up with it. 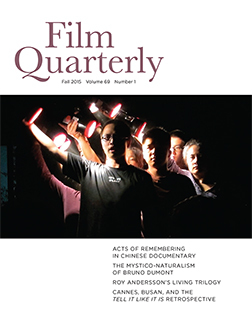 Elsewhere, the nature of lasting affectionate ties is the subject of The Namesake, as Deepika Bahri emphasizes in her essay on the film, and surrogate family bonds hold together the monastic community documented in Into Great Silence, which longtime contributor William Johnson reviews with an apt calm lucidity.